I ordered the plans and bought four 4 X 8 sheets of marine-grade plywood. Ed Moye and I cut one of the sheet in half and made two 12-foot-long sheets by scarfing the ends of the pieces to two full-sized sheets. 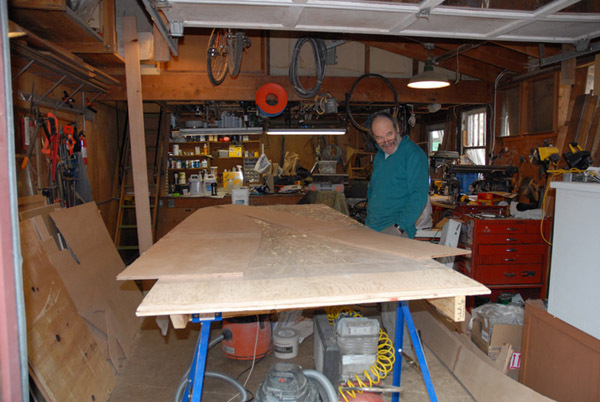 Using a power plane and belt sander, we beveled the ends of the sheets at a 1:12 angle; for this 6-mm-thick plywood (a shade under 1/4 inch), the bevel was 72 mm (about 3 inches) wide. We applied thickened epoxy to the bevel and clamped the joint overnight. After the epoxy had set, we laid out the lines of the boat panels and cut them out with a saber saw. 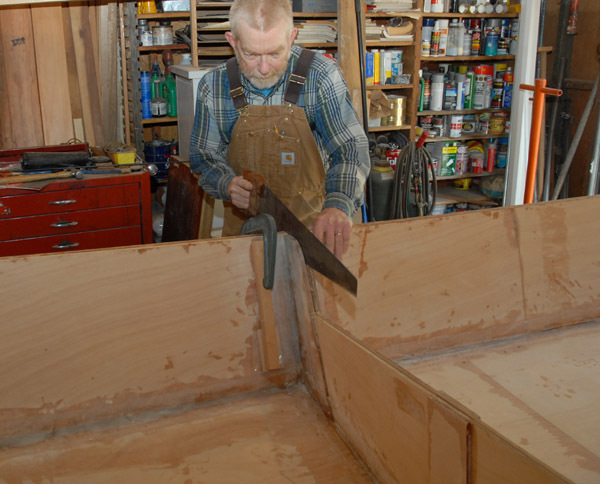 Ed cuts the boat panels from the 4 X 12 plywood. 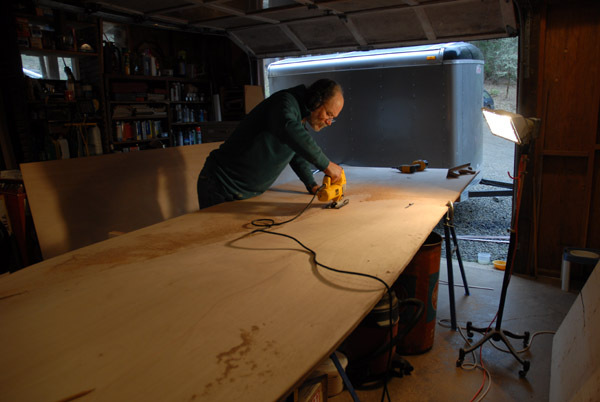 The next step was laying the boat panels out on a 12-foot-long table. 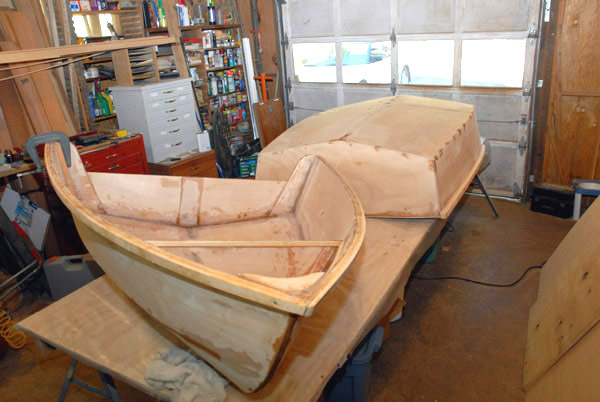 The panels included two bottom pieces and two side pieces, three bulkheads (transverse panels that stiffen the boat), and the stern. 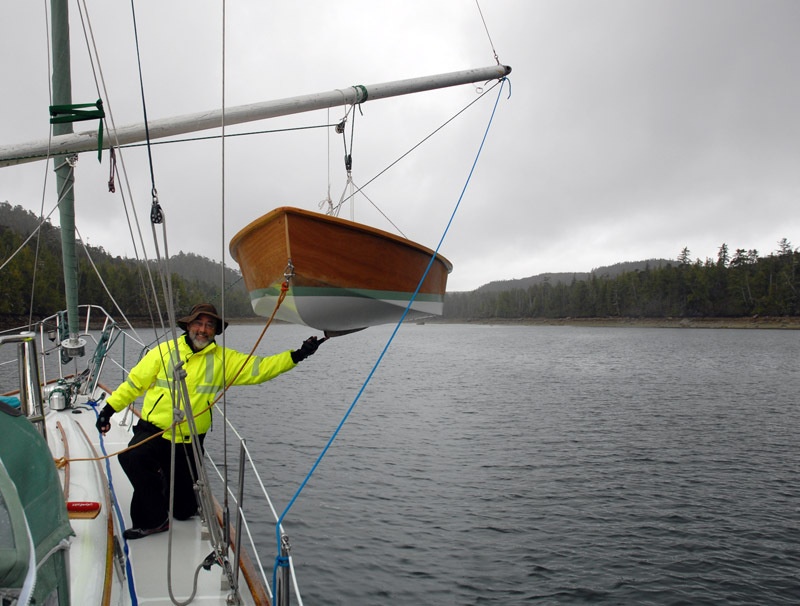 We stacked the port and starboard bottom panels on one another, did the same to the two side panels, then joined each side panel to its bottom panel near the bow with a foot-long piece of fiberglass tape and resin. The bottom panels (to the left) and the side panels (to the right) are taped together near the bow (far end). We drilled holes every 6 inches along the edge of the bottom panels (far left), in what would soon be the joint at the keel, and basted the starboard and port bottom panels together loosely with copper wire. Then we unfolded the bottom panels, the side panels extending out to the sides like wings. The curve of the bow, and the marriage of the bottom and side panels into a chine that softened to the stem, miraculously bloomed as the bottom panels folded out. We worked our way aft, basting the side panels to the bottom panels and installing bulkheads as we went. Ed sewing the side panel to the bottom panel. The forward and midships bulkeads are temporarily fastened in place. A two-dimensional stack of plywood takes on three-dimensional curves. 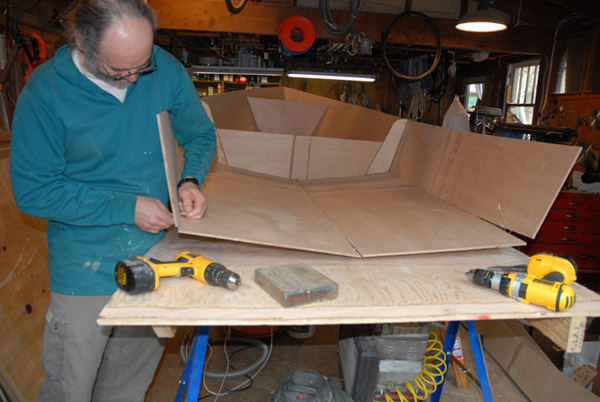 We installed the stern panel and glued everything together, filleting the joints with epoxy thickened with wood flour. After the epoxy hardened, we pulled the wire that sewed the pieces together, ripped a big board of Sitka spruce into 3/8 inch strips, and laminated the gunwales. 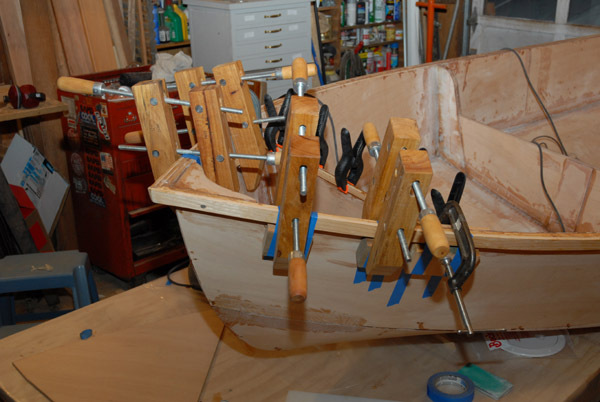 Lots of clamps are needed when laminating the gunwales. The hull shows its sweet curves. The fiberglass tape visible near the bow joined the bottom and side panels while the hull was still two-dimensional. Creative clamping is sometimes necessary. 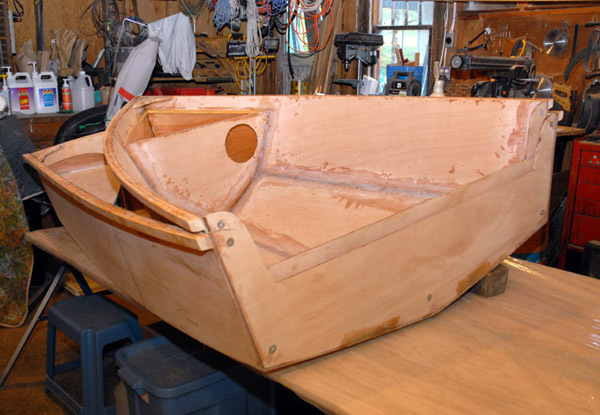 To keep the dinghy compact while stored on deck, it was designed to be cut into two parts, one to nest within the other. Once the lines were fair and the boat was rigid, the next step was to cut it in two. 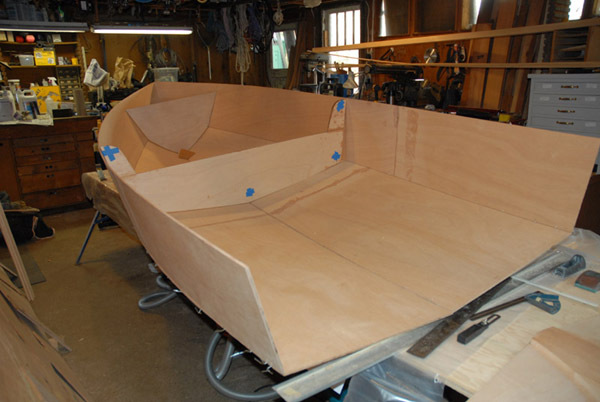 The midships bulkhead is actually two identical bulkheads separated by the width of a saw kerf. Very cautiously, I cut through the hull. 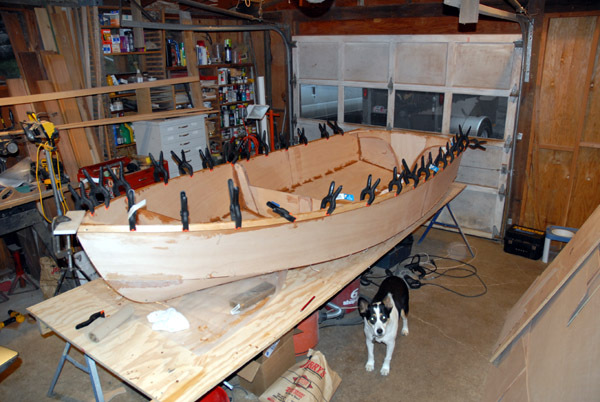 It took some courage for me to take the saw to a boat I had worked so hard to put together. The boat halves assert their independence. The bow nested within the stern. The midships bulkhead show the holes where five bolts will hold the halves together. 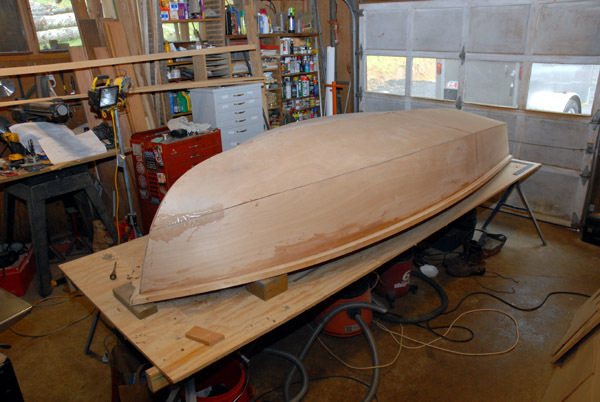 The next steps include fairing and fiberglassing the bottom, installing a few small pieces of plywood or lumber, coating everything with a couple of layers of epoxy resin, painting the bottom, and varnishing the topsides. We named her Clara T after Peter's generous aunt. Clara can be assembled on the foredeck and launched using the whisker pole for a crane. Bob Durnell is eager to go rowing. 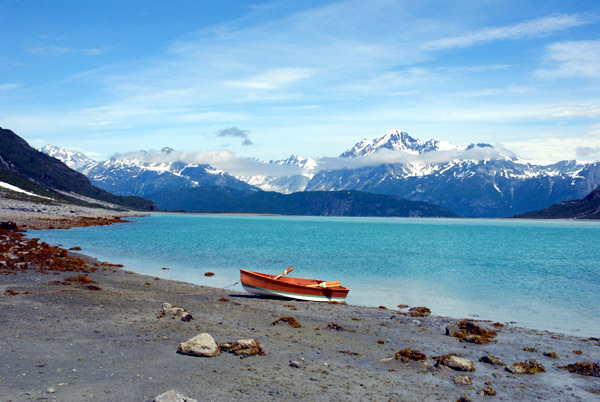 Clara at Reid Inlet, Glacier Bay.